Found 20 file extension associations related to Apache OpenOffice Impress (OpenOffice.org Impress) and 7 file formats developed specifically for use with Apache OpenOffice Impress (OpenOffice.org Impress). Apache OpenOffice Impress is a truly outstanding tool for creating effective multimedia presentations. Your presentations will stand out with 2D and 3D clip art, special effects, animation, and high-impact drawing tools. Master Pages simplify the task of preparing your materials. Save even more time by downloading templates from our Extensions repository. A complete range of Views are supported: Drawing / Outline / Slides / Notes / Handouts to meet all the needs of presenters and audiences, plus an optional multi-pane view to put all the tools at your fingertips. 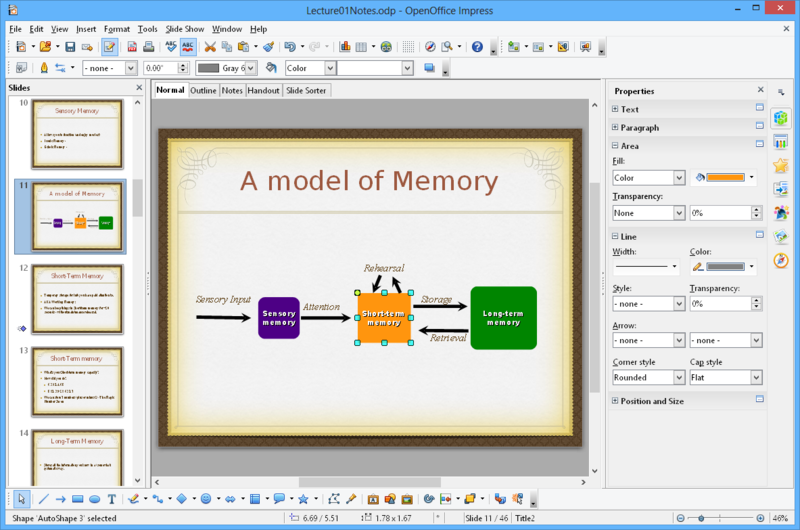 Apache OpenOffice Impress supports multiple monitors, so that presenters can look at something else while presenting their slides on a projector. Make the most of this With the free Presenter Console Extension, which lets you see your next slides as well as the time and the speaker notes. Apache OpenOffice Impress has a complete range of easy-to-use drawing and diagramming tools to spice up your presentation. 'Park' your most commonly used drawing tools around your screen ready for single-click access. Slide show Animation and Effects bring your presentation to life. Fontworks provides stunning 2D and 3D images from text. Create lifelike 3D images with astounding speed and response. If you need more information please contact the developers of Apache OpenOffice Impress (OpenOffice.org Impress) (OpenOffice.org Project Team), or check out their product website.